Today I’ve been catching up on In Our Time. Despite listening to 3 episodes on the commute I’ve still 8 in the feed to catch up on. Fortunately In Our Time is timeless so I can catch up whenever. 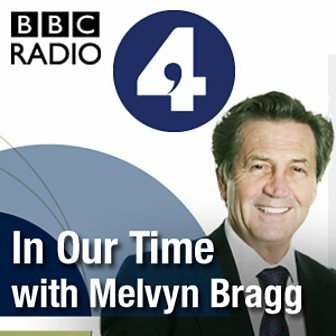 Every week Melvyn Bragg sits down with a group of academic experts and leads them through an exploration of this week’s topic. He must be doing an amazing amount of preparation for these programs, he pretty much always has a good grasp of the subject in hand, and on occasion corrects facts when they are accidentally misspoken by an expert. Today I listened to ‘The Fable of the Bees’ which discussed Bernard Mandeville’s critique of the economy at the start of the 18th century. His work was both scandalous and influential. Mandeville was an interesting character with some radical philosophy. A program well worth listening to. Then I followed up with a program discussing ‘Free Radicals’. These are molecules with an extra electron looking to bond with or disrupt other molecules. It turns out that the discovery of free radicals lead to the chemistry of polymers that in turn lead to the revolution in plastics during the last century. Additionally free radicals have been associated with radiation damage and ageing. Free radicals are not entirely a bad thing, for instance organisms have always used free radicals to create the structural building blocks of life such as lignin in flora and collagen in fauna. Another fascinating listen. I’m currently part way through the episode on Marie Antoinette where the discussion has just reached the time of the French revolution … I’ll find out what happens tomorrow. Ok, I know roughly what happened but I will have a much clearer understanding by the end of the podcast. This entry was posted in Podcasts by Steve. Bookmark the permalink.